Where Ekman transport moves surface waters away from the coast, surface waters are replaced by water that wells up from below in the process known as upwelling. This example is from the Northern Hemisphere. In some coastal areas of the ocean (and large lakes such as the North American Great Lakes), the combination of persistent winds, Earth's rotation (the Coriolis effect), and restrictions on lateral movements of water caused by shorelines and shallow bottoms induces upward and downward water movements. As explained above, the Coriolis effect plus the frictional coupling of wind and water (Ekman transport) cause net movement of surface water at about 90 degrees to the right of the wind direction in the Northern Hemisphere and to the left of the wind direction in the Southern Hemisphere. 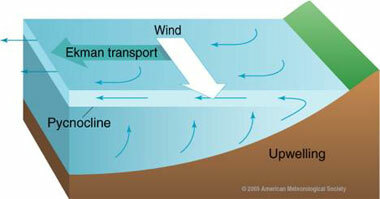 Coastal upwelling occurs where Ekman transport moves surface waters away from the coast; surface waters are replaced by water that wells up from below. 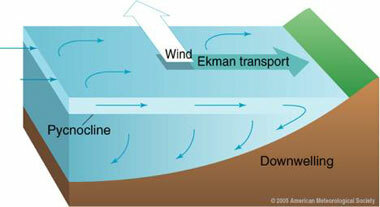 Where Ekman transport moves surface waters toward the coast, the water piles up and sinks in the process known as downwelling. This example is from the Northern Hemisphere. Where Ekman transport moves surface waters toward the coast, the water piles up and sinks in the process known as coastal downwelling. Upwelling and downwelling illustrate mass continuity in the ocean; that is, water is a continuous fluid so that a change in distribution of water in one area is accompanied by a compensating change in water distribution in another area. Upwelling is most common along the west coast of continents (eastern sides of ocean basins). In the Northern Hemisphere, upwelling occurs along west coasts (e.g., coasts of California, Northwest Africa) when winds blow from the north (causing Ekman transport of surface water away from the shore). Winds blowing from the south cause upwelling along continents' eastern coasts in the Northern Hemisphere, although it is not as noticeable because of the western boundary currents. Upwelling also occurs along the west coasts in the Southern Hemisphere (e.g., coasts of Chile, Peru, and southwest Africa) when the wind direction is from the south because the net transport of surface water is westward away from the shoreline. Winds blowing from the north cause upwelling along the continents' eastern coasts in the Southern Hemisphere. Eastern boundary current flowing southward along the California coast of the Western, United States. 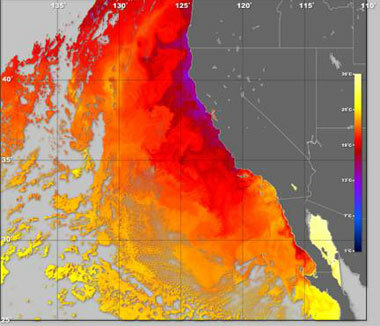 The image is created from Sea Surface Temperature (SST) data from the MODIS instrument, on the Aqua satellite and shows upwelling in the California Current system. The range of orange and purple colors, depict cooler water temperatures resulting from upwelling. The grey shapes, on the left are clouds. Upwelling and downwelling also occur in the open ocean where winds cause surface waters to diverge (move away) from a region (causing upwelling) or to converge toward some region (causing downwelling). For example, upwelling takes place along much of the equator. Recall that the deflection due to the Coriolis effect reverses direction on either side of the equator. Hence, westward-flowing, wind-driven surface currents near the equator turn northward on the north side of the equator and southward on the south side. Surface waters are moved away from the equator and replaced by upwelling waters. Upwelling and downwelling influence sea-surface temperature and biological productivity. Upwelling waters may originate below the pycnocline and are therefore colder than the surface waters they replace. Sometimes upwelling waters are confined to the mixed layer depending on the thickness of the warm layer. You may have experienced upwelling at the beach on a windy day when the warm surface water was blown offshore and replaced by chilly water from below. Where the thermocline is shallow, the upwelling waters are usually rich in the dissolved nutrients (e.g., nitrogen and phosphate compounds) required for phytoplankton growth. This nutrient transport into the surface waters where sunlight, also required for phytoplankton growth (photic zone), is present, results in rapid growth of phytoplankton populations. Since phytoplankton form the base of marine food webs, the world's most productive fisheries are located in areas of coastal upwelling that bring cold nutrient rich waters to the surface (especially in the eastern boundary regions of the subtropical gyres); about half the world's total fish catch comes from upwelling zones. On the other hand, in zones of coastal downwelling, the surface layer of warm, nutrient-deficient water thickens as water sinks. Downwelling reduces biological productivity and transports heat, dissolved materials, and surface waters rich in dissolved oxygen to greater depths. This occurs along the west coast of Alaska in the eastern boundary region of the Gulf of Alaska gyre (driven by winds in the Aleutian low). Alternate upwelling of nutrient poor and nutrient rich waters off the coast of Ecuador and Peru are associated with El Niño and La Niña episodes in the tropical Pacific. During El Niño the pycnocline is so deep that the upwelled waters come from the nutrient poor waters above the pycnocline. In extreme cases, nutrient-deficient waters coupled with over-fishing cause fisheries to collapse bringing about severe, extended economic impacts. Coastal upwelling and downwelling also influence weather and climate. Along the northern and central California coast, upwelling lowers sea surface temperatures and increases the frequency of summer fogs. Relatively cold surface waters chill the overlying humid marine air to saturation so that thick fog develops. 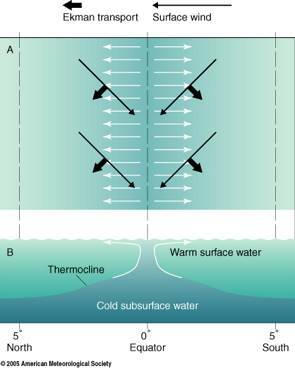 Upwelling cold water inhibits formation of tropical cyclones (e.g., hurricanes), because tropical cyclones derive their energy from warm surface waters. During El Niño and La Niña, changes in sea-surface temperature patterns associated with warm and cold-water upwelling off the northwest coast of South America and along the equator in the tropical Pacific affect the inter-annual distribution of precipitation around the globe (see soon to be listed websites for more on the effects of these changes).